Rufino Tamayo is born in Oaxaca, Mexico, in 1899. He studies art and became interested by the movements of that time, such as cubism, impressionism and fauvism; however, he distance himself from them and now he is considered one of the best abstract figurative artists of the country. But he was also different from other artists for another reason: after the Mexican Revolution, most of the artists worked on political motifs, but Tamayo rejected that position, as he wanted to paint about the traditional Mexico and not just a moment of its history. For this decision, he was considered a traitor and the artist preferred to move to New York, USA, where he painted most of his canvas. 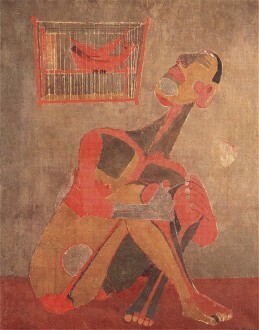 In The singing bird, we see a cage with the little animal in it and, below, very near from it, we see a masculine figure sited with his legs closed, apparently disturbed but the bird’s sing. Figures are almost abstract, but we notice the first influences from another movements in the artist, especially cubism and fauvism. The colors are earthly and thick, which makes the scene rawer. ~ by Álvaro Mazzino on December 1, 2010. Samsung has taken the safe option, the option that lets them hedge bets, the option that minimises exposure to risk, and the option that will bring in guaranteed income but not necessarily enough income to improve on the return seen in previous years. This variance could be used in different games to create different effects – which may finally mean using a touchscreen to control games is no longer inferior to using a games controller. Its business took a hit to start the year. During the Wolverine Q1 earnings call earlier this month, the company said Saucony was down high-single digits for the quarter. Scheduled to release early 2018, the Nike Air VaporMax Strap has a much more of a lifestyle look as it ditches a lacing system in favor for an elasticized strap with a large Nike Swoosh. This entry was posted on December 1, 2010 at 11:27 and is filed under Abstract.You can follow any responses to this entry through the RSS 2.0 feed.You can leave a response, or trackback from your own site.